Election Trinidad and Tobago – How will a Peoples’ Partnership Government handle the CL Financial fiasco? The CL Financial bailout has been a major public concern since it was announced on 30th January 2009 and I have been critical of the steps taken by the current administration to deal with the collapse of what was the Caribbean’s largest conglomerate. The leader of the Peoples’ Partnership (PP), Kamla Persad-Bissessar, has been noted for her strong criticism of the actions of the Minister of Finance in making early withdrawals from the CL Financial group before the collapse. Her arguments in the Parliament are an important part of the story of this fiasco. National elections are Monday, with the distinct probability of a victory by the united PP, so it is timely to consider the way in which that group might handle the bailout. 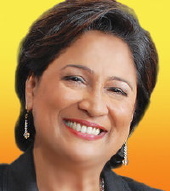 Kamla Persad Bissessar - Finally a woman for T&T Prime Minister? In addition to her major contribution to this debate, the opposition leader has recently promised to revisit the terms of the bailout and that is an intriguing development. It is impossible at this stage to know what the PP will do on this important public matter, but I have been considering the role of certain major players.